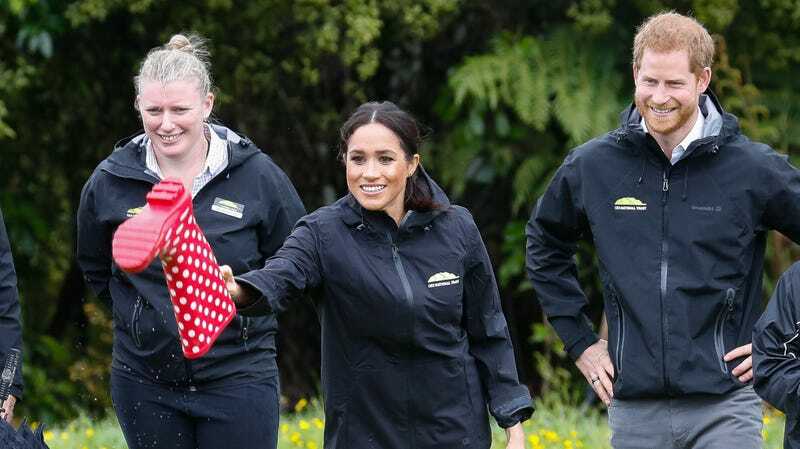 Time to check in with Harry and Meghan as their royal tour winds down; the pair have made their way to New Zealand, where they briefly spent some time “welly wanging.” What, you may ask, is welly wanging? It’s a sport that involves hurling a Wellington boot as far as possible. “Welly wanging” appears to have originated in the Yorkshire village of Upperthong in England, which proudly hosts the annual Welly Wanging World Championships. “The premise is blindingly simple—all competitors have to do is wang (Yorkshire for throw) a Wellington boot as far as possible within defined boundary lines, from a standing or running start,” the website explains. “It’s pretty much the same as the javelin event in the Olympics with the exception that a welly is unlikely to ever skewer an unexpecting judge or spectator.” But the practice has spread to additional damp parts of the world, including New Zealand, where it has become sufficiently popular to merit a royal tour photo op. I am pleased to say there is video. Look—if Harry and Meghan come to the United States, I personally volunteer to take them mud bogging somewhere in rural Georgia.